1).SAARC scientist was gathered in Port Blair to review the climate change impact on? 2).Which country has launched a manual campaign to clean the oil spill in Sunderbans? 3).Mr. Pawan Chamling become the longest serving Chief Minister in India by completing _______ years as CM of Sikkim? 4).Who is the author of the book, ‘Born Again on the Mountain’? 5).Name the Indian Movie that has been nominated for Oscar 2014? 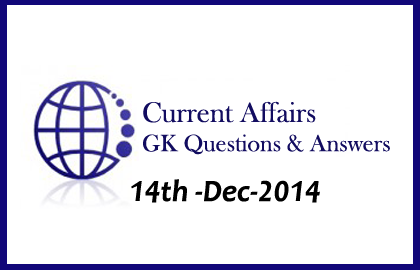 6).Which is the India’s latest Generation launch vehicle that was scheduled to launch in 18th December? 7).Hockey Champions Trophy 2014 final match was played between which two countries? 8).Who is the Miss World 2014? 9).When was the National Energy Conservation day was observed? 10).Bhamashah Scheme Card was launched in which state?